Leading Ukrainian presidential candidate and actor Volodymyr Zelensky failed to show up to a debate with the incumbent candidate, President Petro Poroshenko (pictured above), on Sunday. The candidates are facing each other in a runoff election, which has seen Zelensky, a professional comedian, take a comfortable lead over Poroshenko. But Zelensky has yet to shed light on his policy positions. "I do not like that a presidential campaign in Ukraine looks like a silent movie," Poroshenko said while standing next to an empty podium bearing Zelensky's name at the Olympic Stadium in Kyiv. "I must say: Ukraine's fate is in danger." Poroshenko took Zelensky's absence as an opportunity to bolster his image. He sang an altered version of a Ukrainian folk song about a no-show date: "You told me on Sunday — We'll go to the debate together / I came, you didn't — You tricked me, let me down." 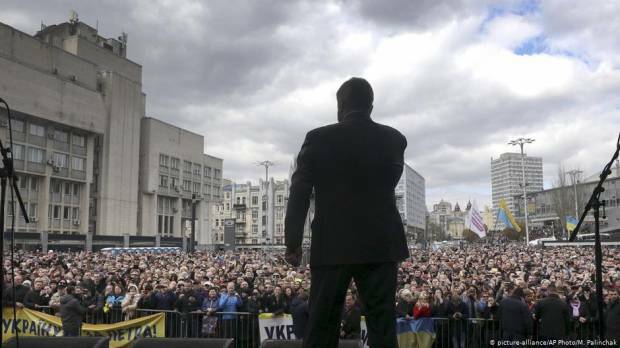 Read more: Ukraine: Is this comedian winning votes because of his political sitcom? Zelensky is best known for playing the president in a popular Ukrainian television show. Instead of staging political rallies, Zelensky has opted for performing satirical shows on his road to the presidency, effectively blurring the line between fiction and reality. Despite revealing little about his platform, pollsters show the comedian winning the vote by up to 61 percent, with Poroshenko failing to poll over 24 percent. But Zelensky has agreed to another debate, scheduled to take place in five days. Poroshenko is hoping to capitalize on his political experience by luring Zelensky into a debate in the hopes of depicting him as an amateur in Ukraine's complex political environment. Pressed on whether he would accept the result if Zelensky wins, Poroshenko said: "It will be the election of the Ukrainian people, and I will respect it — any elections." The runoff vote is expected to take place on April 21. Read more: Is Ukraine's presidential election threatened by fake news?